In the wake of a Louisiana SUV crash that could have stemmed from the failure of a 10 year old tire, lawmakers are pushing for expiration dates. The driver of the vehicle lost control after one of the tires exploded causing the truck to crash into a school bus. No one on the bus was injured but 4 out of the 5 passengers of the SUV were killed. Good Morning America reports that in eight states tire companies have defeated legislation that would put expiration dates on tires. The NTSB and other safety organizations say tires deteriorate over time and could result in failures. 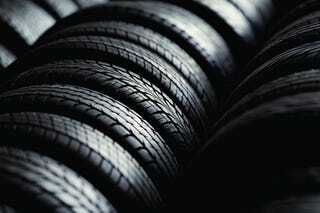 Most major automakers urge owners to replace tires that are more than six years old. The Rubber Manufacturers Association, and industry trade group, says the six-year limit is "an arbitrary date." The association has hired lobbyists to help defeat laws that would require mandatory inspections of tire age. "We oppose legislation that have some sort of age limit on tires," said Dan Zielinski, executive director of the trade group. In contrast, tire manufacturer Michelin cautions that tire age could be an issue and recommends replacing rubber than is more than 10 years old. Also, according to the National Highway Transportation Safety Administration (NHTSA), a tire ages when there is a "loss in a tire's material properties, which over time leads to a reduction or performance capabilities." From How Stuff Works- "You can tell how old a tire is by looking on the tire's sidewall. There are lots of markings ranging from the type of tire, a speed rating that corresponds to a maximum safe speed your tire can sustain, the size of the tire and also when the tire was made; however, if you look after the Department of Transportation (DOT) letters, you'll see another list of numbers. If the tire was made before the year 2000, you'll see three numbers after the DOT letters; the last number indicates the year the tire was made. On newer tires, those manufactured in 2000 or later, you'll see four numbers. The first two numbers indicate the week it was built and the last two digits specify the year the tire was made. So, for example, if you see a "297" the tire was made in 1997, or if you see a "2409" that would mean that the tire was made in the 24th week of 2009." Of course we Jalops bomb exit ramp apexes and do so many burnouts that our tires will never last 6 years. But when you go to purchase a new set pay attention to the year the tires were made in order to get the maximum life out of them.